On August 3rd, our community lost one of its finest citizens. W.L. 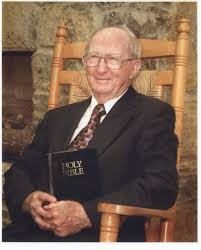 Baker, a Baptist preacher known to everyone as Brother Baker, passed away on his 105th birthday. He was truly a great man who lived by his convictions and helped everyone who he came across. In fact, he was a pastor who inspired me each time I heard him speak. Brother Baker’s specialty was reciting the Sermon on the Mount by memory. As he got older, he did it less and less. However, I was lucky enough to hear it. He was a great preacher and a greater man. Everyone who knew Brother Baker will say the same thing. A lot of people also have a favorite story about Brother Baker, but this post isn’t one of the stories. When I heard about his passing, I thought about all of the things he saw during his lifetime. Imagine how much the world has change since 1908, and Brother Baker witnessed it all. He was born in the latter days of Theodore Roosevelt’s presidency. That means that he lived during the administrations of 19 presidents. Considering that there have been 44, that means Brother Baker was around for 43% of our nation’s leaders. Some other things that happened during Brother Baker’s lifetime. He was a few months old when the Chicago Cubs last won the World Series. The United States entered World War I when Brother Baker was 8 years old. He was 18 years old when Charles Lindbergh flew solo across the Atlantic Ocean. Japan attacked Pearl Harbor when Brother Baker was 33 years old. The United States dropped the atomic bomb on Hiroshima when he was 37 years old. Brother Baker was 52 years old when the Berlin Wall went up and was 81 years old when it came down. He was 55 years old when John F. Kennedy was assassinated. Neil Armstrong stepped on the moon when Brother Baker was 60 years old. When Ronald Reagan was shot, Brother Baker was 72 years old. He was 93 years old on September 11, 2001. Brother Baker saw a lot of events and a lot of changes in the world. Through it all, he held firm to his beliefs and shared good will with everyone. That’s something that everyone should strive for.